How Can a 14-Year-Old Boy Lose Weight? It's no longer unusual to see overweight 14-year-old boys and other young teenagers who need to lose weight. 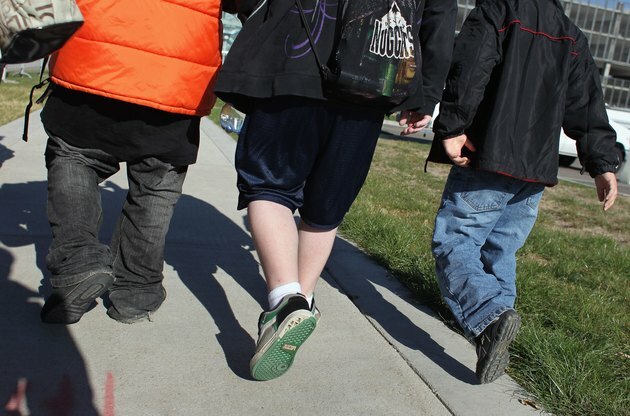 Obesity affects more than 18 percent of those ages 12 to 19 -- a three-fold increase over the past 30 years, according to the Centers for Disease Control and Prevention. However, it's possible for a 14-year-old boy to lose weight safely and even somewhat easily through a combination of diet and exercise. Before starting a diet, you need to make sure that the 14-year-old boy in question really carries too much weight. The CDC's body mass index calculator designed for use with children and teens can help determine this, based on the boy's weight. This chart compares a child's weight and height to others of a similar age. Children and teens are considered overweight or obese if they're heavier than 85 percent of those of a similar height and age. Speak to the teen's physician for confirmation. As for most individuals, a combination of diet and exercise will work best for a teen boy to lose weight. Unfortunately, very restrictive "crash" diets or other extreme steps usually lead to regaining the weight, sometimes very quickly. Instead of taking the extreme approach, try eliminating junk food and eating more fruits and vegetables, along with lean meats. Also, skip the sodas and calorie-containing sports drinks; drink water instead. For a 14-year-old boy to lose weight, it's possible the whole family will need to get involved. Teens likely will need their parents' support and help to stock healthier foods in the house and to fix lower-calorie meals. In addition, children and teens succeed more rapidly at weight-loss efforts if their families support them and help them. Teens become overweight for two reasons: they eat too much -- often junk food -- and they get too little exercise. An overweight 14-year-old boy may find that he doesn't need to cut calories severely -- he just needs to put down the video game console and go outside for some physical activity. Organized sports also can help teens get active and lose weight. If the 14-year-old boy in question is truly addicted to video games, though, try games designed to spur activity, such as dance party video games. KidsHealth.org: Teens Health; How Can I Lose Weight Safely? How Can I Help My Seven-Year-Old Lose Some Weight?